I’ve never met a pancake that I didn’t LOVE! Well, maybe that’s a bit of an overstatement. Some pancakes aren’t as light and fluffy as I would’ve liked, but with a big glug of maple syrup I’ve usually managed to clean my plate. I don’t follow a gluten-free diet, so when I made these Healthy Pancakes I was cautiously optimistic. I was making pancakes, after all!! These clean eating pancakes featured in Lexi’s Clean Kitchen Cookbook did NOT disappoint! They are light and have great flavor. This is Alexis Kornblum Davidson’s first cookbook and it is a doozy! And this is NOT an overstatement. Lexi’s clean eating journey started in her 20’s when she realized how much better she felt after eliminating foods that contain gluten and dairy. 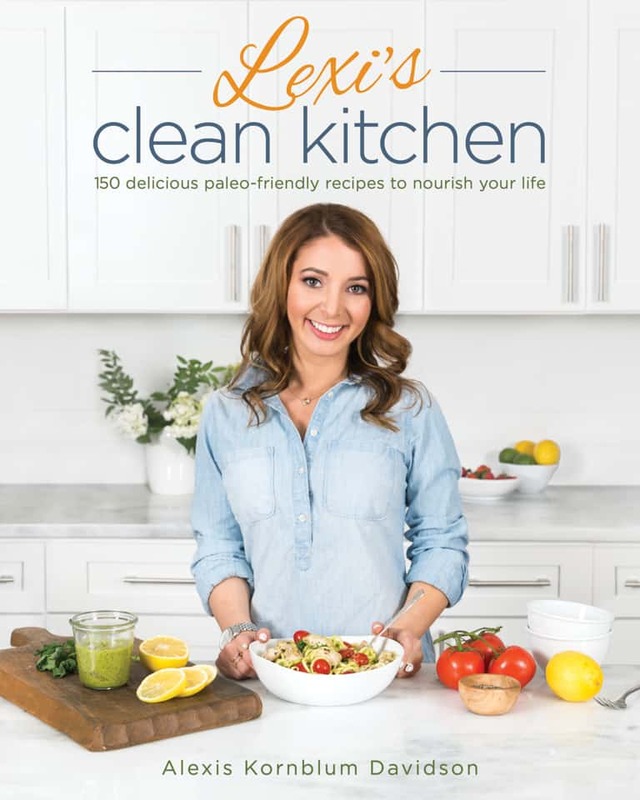 This lead to the creation of her blog Lexi’s Clean Kitchen to share her experience and recipes. I love Lexi’s practical approach to her nutrition. One of the first chapters in her book is Clean Eating 101. She quickly and very helpfully describes the difference between paleo and clean eating and the importance of balanced nutrition and most importantly that it should not be an all or nothing approach. Her best advice is that nutrition is not one-size-fits-all. It needs to be a very individual plan. 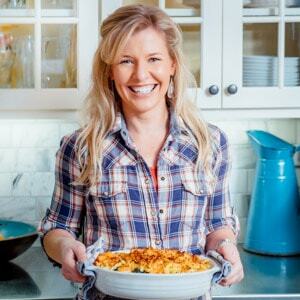 Lexi’s book provides a roadmap along with a collection of delicious recipes with variations to fit everyones’ needs. This chapter is followed up by the Foundations of Healthy Living highlighting the importance of stress management, sleep, diet and exercise. Then quick chapters on How to Use This Book and awesome tutorials on ingredients and tools and equipment. AND I haven’t even gotten to the recipes yet!! All 150 of the recipes are gluten-free and most have options to make them dairy-free, nut-free, egg-free or paleo-friendly. She covers it all from breakfast to appetizers, sides to mains and even sweat treats. Like the Maple-Crusted Salmon with a sweet and spicy rub that’s ready in 15 minutes! Or the Garlicky Blistered Green Beans with only 5 ingredients and packed with flavor! And I can’t go without mentioning her Double Chocolate Cupcakes topped with a Chocolate Buttercream Frosting that are dairy-free and paleo-friendly! They look crazy good, people!! This isn’t just an amazing cookbook filled with yummy recipes. It’s a practical guide to improving your health from the inside out! 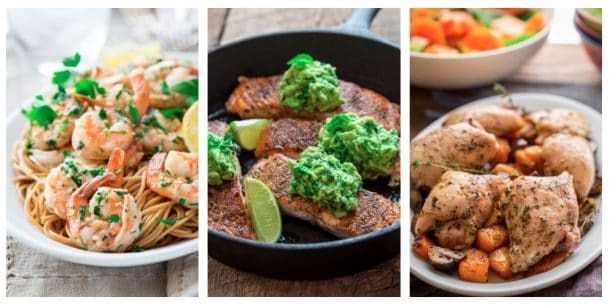 If you’re gluten-free, considering trying a gluten-free diet or if you just like really good healthy food, you will want to check this one out! I’ll tell you that I’m definitely looking forward to diving into Lexi’s book a little deeper and refining my personal nutritional plan! 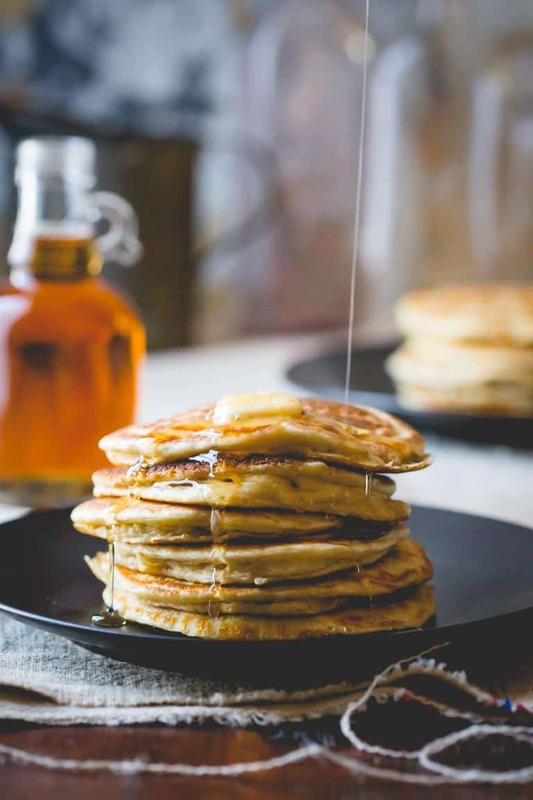 In addition to being delicious, these healthy pancakes are also good for you since they’re gluten-free and refined sugar-free. Lexi even provides a recipe for a super convenient pancake and waffle mix that she says has become her most requested Holiday gift from family and friends! AND to add to this goodness, this amazing gluten free Spiced Hot Fruit Bake by Cotter Crunch would be the perfect topping for these pancakes. Big Time-Bonus!! 1. 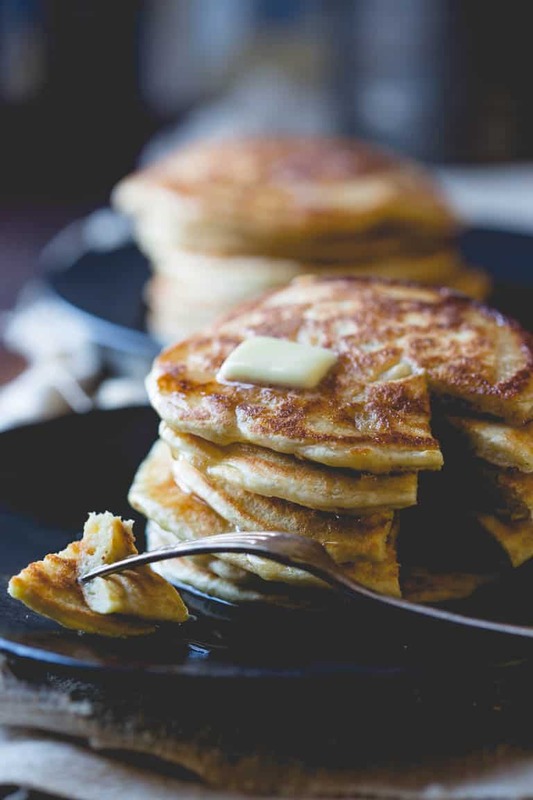 Make the pancake batter — These healthy pancakes are made with a mixture of almond flour, tapioca starch, baking powder, eggs, unsweetened applesauce, sea salt, and vanilla. That’s it! Mix that all up to make the pancake batter. 2. Heat skillet over medium heat — Heat a small pat of butter or coconut oil in a skillet over medium heat (you don’t want the temperature too high or too low!). 3. Cook the pancakes — Pour the pancake batter into the pan to make 3- or 4-inch pancakes. You’ll know when the pancakes are ready to flip when the batter forms bubbles on top. Once the pancakes are finished cooking, transfer them to a plate and continue cooking the rest of them. To save yourself time later on, you can make a big batch of dry pancake mix for later. Simply place 1 cup of blanched almond flour, 1 cup of tapioca flour, 2 teaspoons of baking powder, and 2 pinches of fine sea salt in a large mason jar. Screw the lid on tightly and shake to blend the ingredients. You can store the pancake mix in the pantry for up to 1 week or in the fridge for up to 1 month. This will make 2 cups of pancake mix, which is enough for two batches of pancakes. These light and deliciousHealthy Pancakes are gluten-free and have options for paleo-friendly and dairy-free versions. 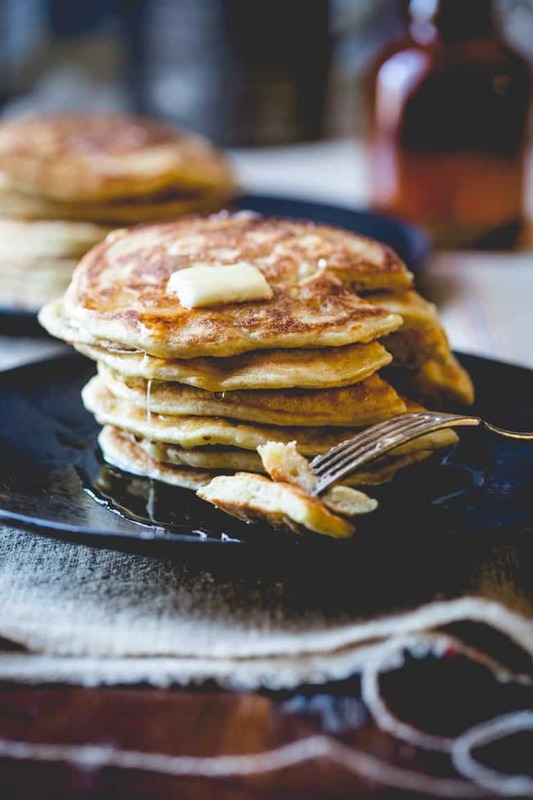 There is even a recipe for a convenient pancake mix to make these even easier to whip up in the morning for a healthy and yummy breakfast! Whisk together the almond flour, tapioca flour, baking powder, and salt in a mixing bowl, preferably one with a spout. Add the eggs, applesauce, and vanilla and mix well to combine. Stir the desired add-ins, if using, into the batter. Pour the batter into the skillet to form 3- to 4-inch pancakes. Cook for 2 to 3 minutes, until bubbles begin to form on the top, then flip and cook for an additional 2 to 3 minutes, until the pancakes are fluffy and golden brown. Remove from the skillet, set aside, and repeat with the remaining batter. Serve immediately with butter and maple syrup. 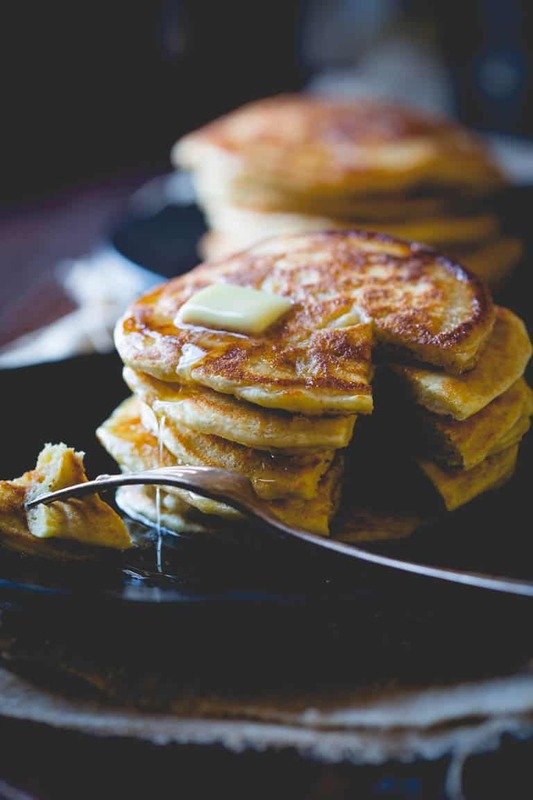 Store leftover pancakes in the refrigerator for up to 1 week or in the freezer for up to 6 months. Paleo-Friendly Option: Use ghee or coconut oil for the pan and serve with maple syrup only. 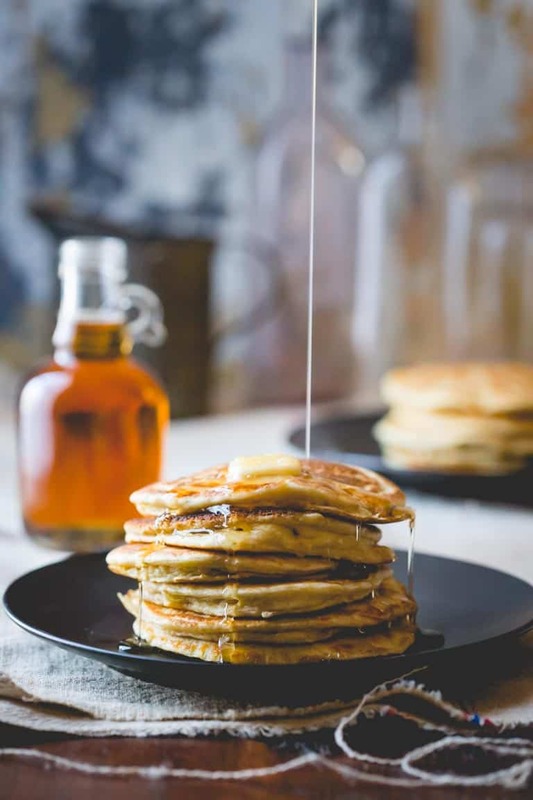 To make a batch of convenient pancake and waffle mix: place 1 cup of blanched almond flour, 1 cup of tapioca flour, 2 teaspoons of baking powder, and 2 pinches of fine sea salt in a large mason jar. Screw the lid on tightly and shake to blend the ingredients. Store the mix in the pantry for up to 1 week or in the fridge for up to 1 month. (Don’t forget to label and date the jar!) Shake the jar to re-blend the mix, then wait about 30 seconds to let it settle before opening the jar. Makes 2 cups (enough for two batches of pancakes or waffles). Thank you so much for sharing!!! Now I want a stack of pancakes!!! It was a pleasure Lexi! I have really enjoyed your cookbook! And the pancakes are fantastic!! Thanks Carly! They are also delicious! The images are beautiful and the pancakes look delicious. I like that she has a pancake and waffle mix recipe. The mix recipe is awesome! It would be the perfect Gift from the Kitchen this Holiday season. Thanks Annette!! These look perfect for cozy holiday mornings! They would be perfect any morning, but especially a holiday morning!! What does 135kcal mean? Please tell me there are not 135 “thousand” calories in this one recipe. Ha ha, that would be unfortunate wouldn’t it Gwen? Thanks for asking. To answer your question, we are using a new recipe plug-in here that is designed by a European developer. In Europe nutrition labels call them “kcal” and here in the states we have “Calories.” They are the same. Not to be confused with a little c calorie which is indeed 1000 kcal. You can read more about it here: http://www.livestrong.com/article/311197-how-many-calories-does-one-kcal-equal/ Hope that helps and I also hope you have a great day. I love pancakes, Can’t wait to try this recipe! It’s a great one! Enjoy Janet! 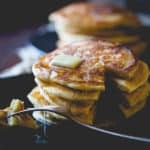 Can these pancakes be made with a different gf flour (I have a food sensitivity to almonds), and can it also be made with egg substitute? If so, which flour and egg substitutes are best? Thanks so much for weighing in Lexi! And Sonia, hope you enjoy the pancakes! Hello, I made these pancakes for my family as a gluten-free low-carb option, since we are following a modified food plan. I was excited, until I reviewed the ingredients. I thought, for sure that can’t be right, because for two eggs alone I knew in my mind that was 180 calories. I scanned the ingredients into my fitness pal. For 4 pancakes (a serving), they are 755 calories… a whopping 188 calories per pancake. Whelp! Please revise the recipe to reflect the true caloric content! I think the calories per serving of 206 is meant to be one pancake with maple syrup. The pictures are misleading but I think the “yield: 4” means 4 servings, so one serving is only 1 pancake.